You Are an Artist Co-Op Program - You ARE an ARTiST! We love when artists gather around and enjoy our tutorials! And because we love to see smiles spread on faces gathered around the table, we have a program just for co-ops and groups. We offer a group discount for co-ops/groups using five or more student copies of a single art title. Simply send us an email at Coop @ chalkpastel.com and let us know the number of families (or class size), the title of the art curriculum you would like to use, and any other information you would like to provide. We will get back to you with details and information as soon as possible. 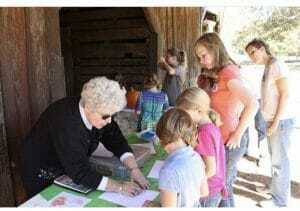 Nana teaching a homeschool group in 2010. Now she can teach even more with her online video art lessons! Courtney at Grace Grow Edify shared a great example of how her co-op used our Fall Video Art Course, including set up and the few supplies. 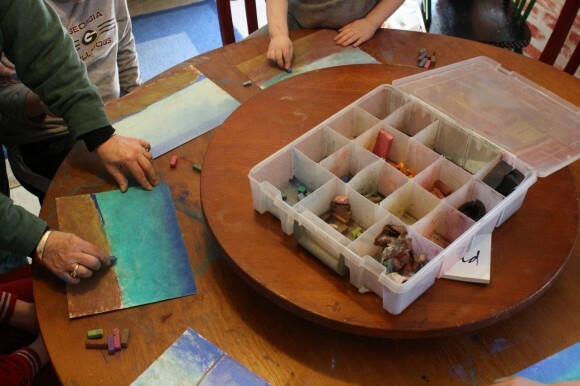 How to Organize a Homeschool Co-Op Art Workshop with Chalk Pastels. Thank you for building a love of art!